Virtual travel & island guide about the Waterfalls on Ko Chang in Thailand. Ko Chang accommodates several waterfalls of different sizes, which all have plenty of water at the end of the rainy season (Oct/Nov) and are most delightful during this time. The 4 most well-known can be reached by foot, one or two however, under difficult conditions. Good footwear should be worn and company is advisable in case of a possible accident as no help can be expected. We present some pictures and directions in a clockwise direction beginning with Khlong Plu Waterfalls. Klong Plu Waterfall (or Khlong Plu Waterfall): The branching to the waterfall is at the main road between Baan Khlong Prao and the northern end of Khlong Prao Beach. A 2 kilometre concrete road leads to the Marine-Park-Office. There you will find a few small restaurants and here you also have to pay the entrance fee of 200 Baht for foreigners (children younger than 14 years: 100.-) or 20 Baht for locals. 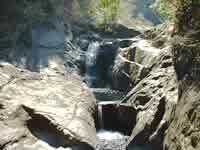 After approximately 500 metres walk, you arrive at the foot of the falls which are about 20 metres high. Here you will find some pools suitable to bathe in. Mu Ko Chang National Park). Only the more experienced trekkers should try this path alone and should get good documents beforehand at the Tourist-Information or at the National-Marine-Park-Offices. 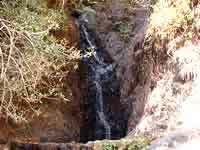 Than Mayom Waterfall: This waterfall consists of 3 individual levels of different sizes. The first can be reached in 10 minutes simply by foot from the entrance. Here there are 2 pools in which one can take a refreshing bath. In another 30 minutes a rough and narrow path leads up to two further falls. The third fall is called the King Rama Waterfall. 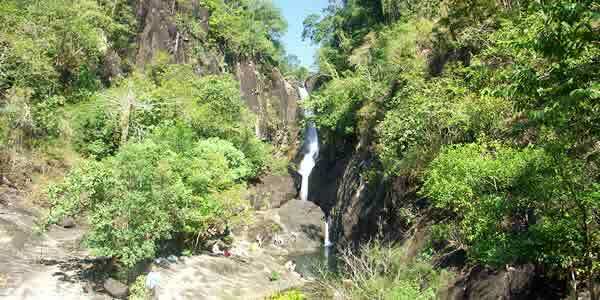 Treks to Khlong-Plu-Waterfall are possible (see above Khlong Plu Waterfall). The admission fee for a visit is also 200 Baht for foreigners (children younger than 14 years: 100.-) and 20 Baht for Thais. At the beginning of the path to the waterfall (approximately 300 metres from the road) a small shady restaurant with a parking lot and sanitary facilities is situated. Ke Rhepet Waterfall (also Khiri Phet Waterfall or Tri Petch Waterfall): From Baan Salak Phet a more or less easily passable jungle track leads, after 1.5 kilometres, to the beginning of a footpath. After a few hundred metres, one reaches the first level of the 12-storey-waterfall, where a small pool to bathe in waits for you. The further levels of the waterfalls are reached over a very difficult adventurous path from where you have a breath-taking view over Salak Phet Bay (see What to do on Ko Chang?, Viewpoints on Ko Chang). 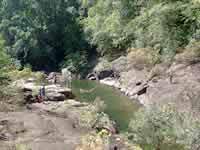 Khlong Nung Waterfall: After 3.5 kilometres on a jungle track one reaches the footpath, which leads after another 500 metres to the waterfall. However, this way is rather difficult.